The theme over at I ♥ Faces this week is Smile! Alexander has some of the sweetest smiles around. I just love our little Handsome. Awwwwwww!! That's the most beautiful smile I've seen today!! Awwww! I love toothless smiles! Adorable smile and LOOK at those gorgeous eyes!! Great shot! Oh my God, so cuuuuuuuuuute! His smile is great and I love his eyes! Good capture! such a cutie. love that little face and sweet smile. soo so cute! i love it. Oh.my.goodness. That is just the sweetest smile ever! Aww! 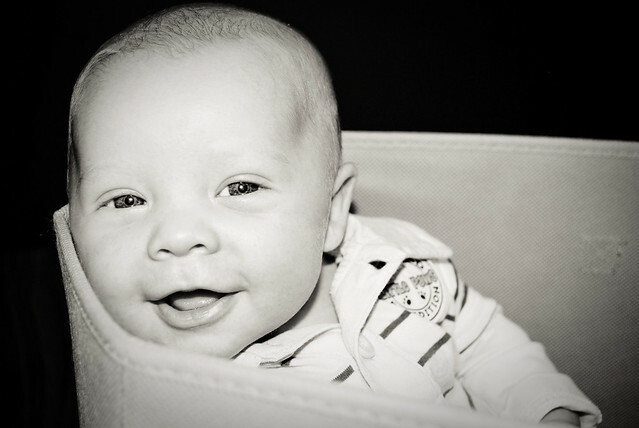 He sure got started early on the heartbreaker smile! Oh my goodness...how precious is that face?! Precious. I LOVE your banner photo! Not fair... you're going to make the other two jealous ;-P Love the banner pict! He is so adorable!!! I love your header too! Wonderful picture! He is adorable!